After a 4-year absence - Geddy Lee and Alex Lifeson team up once again for the fourth installment of their "definitely not so annual" Excellent Harvest Adventure. Geddy and Alex will welcome you aboard private train number "2112" from Toronto's Union Station as we enjoy breakfast enroute to Niagara Wine Region and the beautiful and expansive Peller Estate Vineyards. Back in 2014 a few diehard Rush fans who were inspired by Rush's many charitable donations over the years, put together the 501(c)3 charitable organization Overtime Angels with the goal of helping individuals in need that might not be able to receive help from large charitable organizations. The organization will be hosting their second annual RushCamp! event/fundraiser this coming Labor Day weekend at Independent Lake Camp in the northern tip of the Pocono Mountains near Scranton, PA. 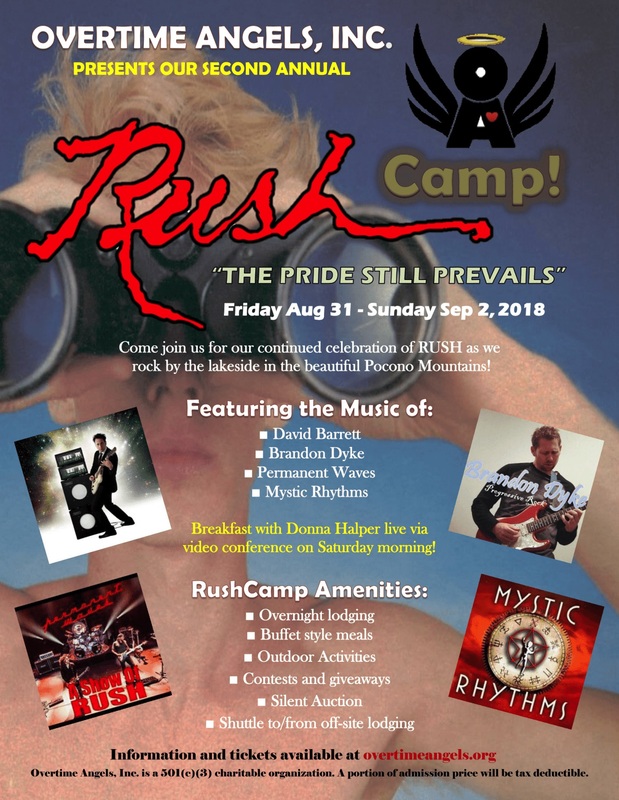 The camp will run over Labor Day weekend from Aug 30 to Sep 2, 2018, and feature music from Brandon Dyke, David Barrett, and Rush tribute bands Permanent Waves and Mystic Rhythms; an appearance via Skype by Donna Halper; and much more. Yesterday they launched the online portion of their silent auction, which includes two rare live photographs of the band by photographer Craig M. Renwick - one photo signed by Neil Peart showing the Professor and his kit, and a band photo signed by ALL THREE members of the band. Overtime Angels' Jim Brunke explains the story of how they obtained these photos and the band's signatures, along with all the auction details in this video. Overtime Angels are also currently running a fundraising charity raffle to complement the event, with "glittering prizes" including a Tama Superstar Drum Set, a signed David Barrett album or a special US $100 bill. For all the details and to purchase your raffle tickets visit this location. Details and ticket information for RushCamp! 2018 is available at overtimeangels.org. Alex Lifeson is easily one of the most underrated guitarists of all time. For proof, look no further than "Hemispheres." You'd be hard pressed to find a more epic showcase of prog-rock guitar than the 12-part "La Villa Strangiato." The album will celebrate its 40th anniversary this coming October, and Rush is expected to release a celebratory box set later this fall, similar to last year's A Farewell to Kings 40th anniversary set. Speaking of which, the A Farewell to Kings box set is one of the nominees in the 2018 Progressive Music Awards in the Reissue of the Year category. Today is the final day of voting, so go cast your vote for Rush here. The 2018 Progressive Music Awards will return to the Underglobe, beneath Shakespeare's Globe Theatre on London's Southbank, on Thursday September 13th. 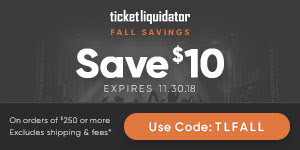 For all the details and to vote in all the other categories visit loudersound.com. The album that laid the foundations for Rush's post-sword-and-sorcery career. 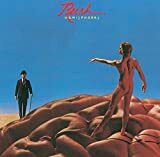 After 1978's confused Hemispheres, Permanent Waves highlighted a leaner and less convoluted approach. Rush wrote deceptively memorable songs, while at the same time retaining their art-rock tendencies. A top-five album on both sides of the Atlantic, Permanent Waves also spawned the hit single The Spirit Of Radio. There was a Canadian record promoter named Bob Roper. He sent me this manila envelope with a record from A&M of Canada. I open it up and it's got this really "loving hands at home" kind of cover, like, ooh, somebody got together and made a record. And, it's from this band called Rush. I've never heard of them. I've heard of Mahogany Rush -- they're from Montreal. I open it up and I'm looking for a long song, because we are an album rock station. Long songs were jokingly called bathroom songs, because when the DJ was on the air late at night and needed to go, it was nice to have a long song. So I'm always looking for a long song, but it has to be a good song. Emerson, Lake and Palmer, welcome back my friends, to the album that never ends, no thank you. I drop the needle on "Working Man" and I knew immediately. I got in touch with Roper and I'm like, "What's up??" He says, "We're not going to sign them, they're not ready, but I heard something, see if you hear something." I'm like, "Are you kidding me, yeah, absolutely." "Working Man" is a perfect Cleveland record. I get up at 7 and I go to work at 9, got no time for livin', yeah, I'm workin' all of the time. There they are and Cleveland's a factory town back then, Republic Steel, the night sky is orange with pollution. I just figured it would resonate. I brought it down to Denny Sanders and I said, "Denny, you've got to play this. He did and the phones light up immediately. "When's the new Led Zeppelin coming out?" Nope, not Led Zeppelin, Canadian band, Rush! Wow, okay, play it again? Pretty soon, we're getting requests for it. You know the rest, I got in touch with their management and I said, "Hey, you guys are doing really well in Cleveland." They're like, "Really? Nobody in Toronto wants to play us!" One thing led to another, we got a box of records down, put them in Record Revolution, Peter Schliewin, God rest his soul. Back then, that's where you got your imports, at Record Revolution. Alex Lifeson will be joining his bandmates as the newest member to enter the over 65 retirement club this coming Monday, August 27th. Happy early 65th birthday Lerxst!! That's all for this week. Have a great weekend!